Sundays — Sat evening: 5 p.m.; Sun: 8 a.m., 10 a.m., 12 noon, 5 p.m. In 1951 Archbishop John A. Floersh assigned Father Ehrich J. Stuart as the first pastor of Saint Margaret Mary. Property acquired in November had a home on it that became the rectory. The first Mass in the new church was celebrated on August 2, 1953. The following month, the Ursuline Sisters of Mount St. Joseph staffed the new Saint Margaret Mary School. By 1956 a larger school became necessary. In 1975 the church and school were renovated and Stuart Hall (gymnasium) was built. The present church was dedicated October 17, 1992, forty years after the cornerstone of the first church had been laid. Since 1994, the parish has committed to the practice of full stewardship as a way of life. 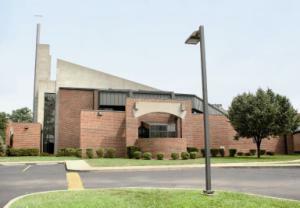 In 2001 a pastoral center was constructed, and in 2001 the school was expanded again. One of the largest parishes in the Archdiocese with more than 2,000 families and dozens of parish programs and ministries, Saint Margaret Mary is bustling with activity. Educating children through the parish school and the parish philosophy of stewardship are major priorities of this faith community. We also provide Sunday morning Parish Religious Education Program (PREP) for our parish children not in the school. Through the commitment and generosity of the parishioners, the school is a “Blue Ribbon School” for excellence, twice recognized (2004 & 2015) by the United States Department of Education. Parishioners also excel in reaching out to interact with community groups and providing assistance to those in need. The commitment to education and formation will continue as the nearly 5,900 parishioners of Saint Margaret Mary focus in their strategic plan on lifelong formation and whole community catechesis. Through this effort Saint Margaret Mary hopes to met the formational and spiritual needs of all members in a comprehensive way as we grow as disciples of Jesus Christ.